Looks Good from the Back: Adrien: Boden Milano Dress, Finally! It's super comfortable and hangs really nicely without stretching out. It's still available in a few colors and sizes but unfortunately the black/grey/white version is long gone. 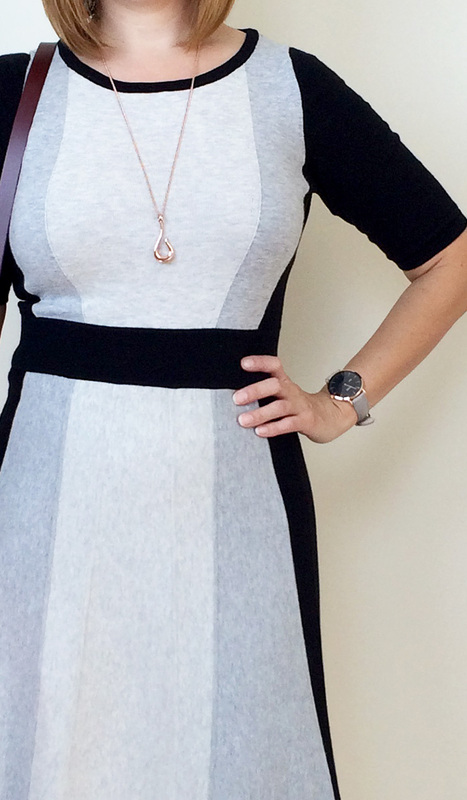 There's also this very similar Boden knit dress which I'd buy in a second if my size was in stock. And this new one has promise with the same sort of colorblocked black/grey/ivory colorway! I'm carrying my new Cambridge bag (20% off right now! ), which I reviewed earlier this week. 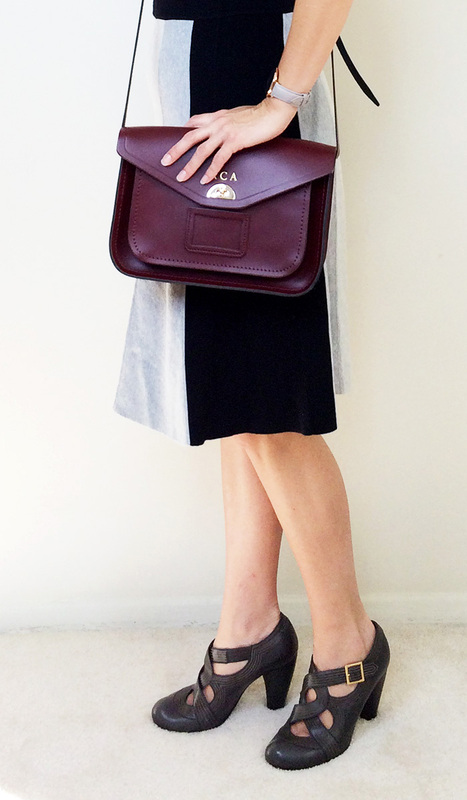 For a similar look this Susu bag definitely has the right color and hardware. For a bargain pick, Forever21 has you covered. A lot. Details! I'm wearing my Giles and Brother hook pendant which looks to be sold out but they also do a railroad spike pendant that is really cool. I also think this Madewell pendant has a similar look and weight. (And on sale!) My watch is CLUSE La Bohème and I've been wearing it daily since I got it. 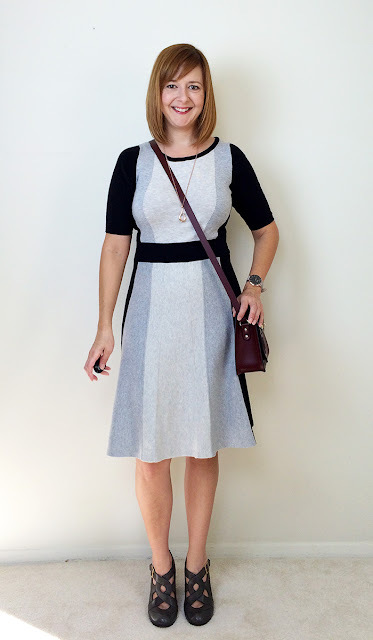 I'm not sure if my shoes were the best choice with this dress but I loved how the greys work together and the gold buckles play nicely with the gold hardware on my bag. They're old Chie Mihara Serpans and I don't know that there's anything really similar, but these grey Chie pumps are pretty fly and ooh, these ankle boots with the buckle! Wow Adrien! You look absolutely stunning! I have always wanted one of these dresses from Boden and now I just have to try it out. Any sizing recommendations? Thanks! 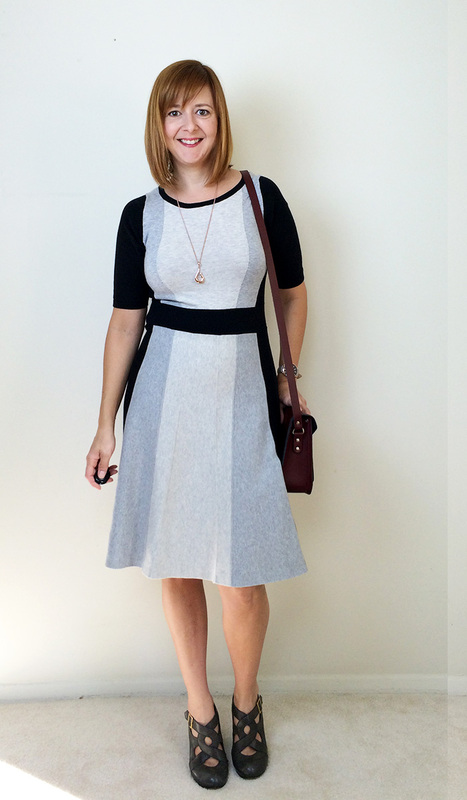 I'm wearing my usual size 6 here and I've generally found Boden to be true to size.